NFIB tracks the key legislative issues identified by our small business members every session and then we tabulate a score for each Missouri lawmaker in the state House and state Senate. 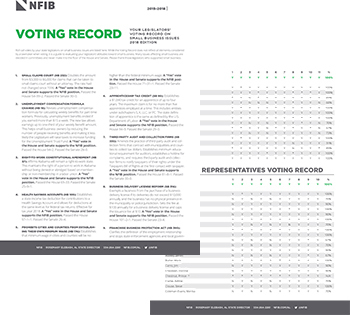 The NFIB voting record provides a critically important evaluation of a legislator’s attitude toward small business based on floor votes. You won’t find a more effective way to gauge the performance of politicians than examining their voting record. 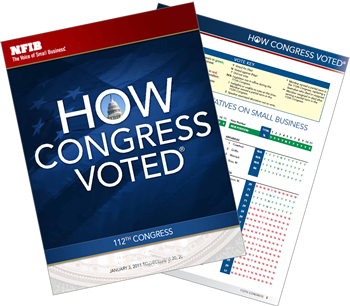 While most elected officials claim to support small businesses, the NFIB voting record gives business owners and other citizens a picture of what your state representatives and state senators are up to in Jefferson City. Please thank those legislators who supported small business and continue to work with those who have fallen short.